The Auto Degauss System has multiple cable power delivery options applicable to large turbine and generator rotors, steam turbine blading and casings, pipes, vehicles, ships, aircraft and even buildings! 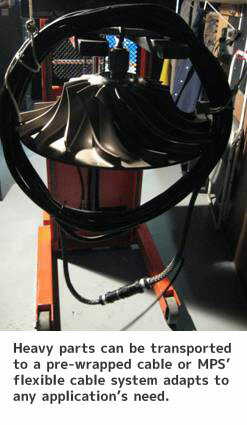 Control of residual magnetism at pipe welds, reducing welding time and eliminating arc blow out. “Downcycle” demagnetizing with Full-Wave DC eliminates residual magnetism in complex metal structures, machinery parts, and high strength alloy components. Magnetizing for Magnetic Particle Inspection followed by thorough demagnetizing using the same cable set-up to save time! Utilize the Auto Degauss for ‘Loop’ or ‘Core’ testing for lamination shorts in electrical machines up to 500 HP/KW. Auto Degauss and Cable System is powerful enough to magnetize Permanent Magnet Generator Poles. Demagnetize all diameter pipelines with the Auto Degauss’ versatile cables and/or “neutralize” troublesome magnetism at weld locations. The MPS ADG can prevent costly downtime of rotating equipment by removing residual magnetism, which is often the source of damaging stray currents. Manual AC for surface demagnetizing. Manual DC for demagnetizing and magnetizing. Automatic Full-Wave DC "Downcycling" for quality demagnetizing penetration of large or small items. Complete portability makes for easy use on scaffolding or in trenches; anywhere line power is made available. Single-phase voltage input (115-265V) from power sources of either 50 or 60 Hertz allows for use with almost any portable generator (10kW, for maximum power). The process of “downcycling” strategically and systematically reduces deep-seated magnetism to zero. At each “downcycling step”, the Auto Degauss reverses polarity and applies a precalculated power value to gradually reduce the magnetic field. Preset “hold times” attain magnetic field penetration into heavy steel sections thereby minimizing the number of runs required to remove residual magnetism. The Auto Degauss and accompanying cable transports completely in a self-contained, wheeled carrying case with retractable handle for easy movement and storage. Employs flexible cables available in 60, 100 and 120 foot lengths, for wrapping around or through large parts with “difficult to demagnetize” areas. If increased demagnetizing and/or magnetizing is needed, optional items provide increased power by 2X or more, for even the toughest of jobs! The Auto Degauss can “trim” or “neutralize” residual magnetism down to acceptable levels, at weld locations on a pipeline or between steel beams. The advanced and compact design of the Auto Degauss eliminates the need for bulky transformers, yet power delivery is equivalent to large “mobile” demagnetizing units that require cranes, forklifts or trucks to move. 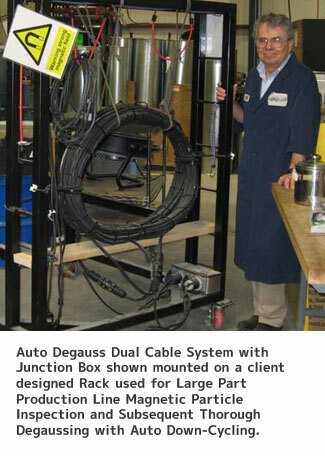 The superior efficiency of the Auto Degauss means that power draw from the line equals power delivery to the cable. 1. Cable wraps apply easily and quickly for magnetizing and/or demagnetizing. 2. No need to bring the job to a shop, perform it on-site! 3. Variable controls benefit demagnetizing of large items such as pipes, shafts, casings and bearings, as well as small items such as bolts and studs. 115-265V, 40 Amps, Single Phase, 50/60 Hz. We Highly recommend the MPS Degaussing Unit, see our answers below [in bold] embedded in your inquiry. 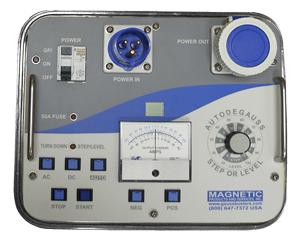 We got your reference from an MPS Gaussbuster Electrical Engineer at Magnetic Products & Services, Inc.
1- Since how long have you been using Auto Degauss (ADG) [and the Original Auto Demag Unit]? 2- Are you using this product for demagnetizing pipelines or rotor of machines? 3- Is it possible to demagnetize a rotor below 02 gauss by using this product? Have you done that on any rotor? If possible kindly send us some details. We do this as our business, please see photos (sorry - not included here). 4- Is it possible to demagnetize a rotor without removing it from machine by using Autodegauss? Not very effectively, we recommend disassembly. 5- Is it material specific or it is possible to demagnetize any type rotor material which is magnetic? Hysteresis is material specific, therefore some materials are more difficult to demagnetize than others. 6- Can this product be used to eliminate electrical run out of the rotors from vibration probe sensing area below 2 gauss? Thanks... We are using your machines every day. I want to echo Jeff's acknowledgement and thanks - It is great to have such a responsive and helpful group willing to go that extra mile to help us out when we're in a bind. I hope to have the privilege of working with many of you in the future. - Kurt S. Plant Engineering, An Illinois dual-unit nuclear power plant. When we first brought in the Auto Degauss unit, there were some people that were really skeptical because of its physical size. They had seen other, larger units not work as expected; so this was really going against traditional paradigms. Phil, one of the MPS service engineers, worked with us to reduce the magnetism on our part that weighed over 10,000 pounds down to very acceptable levels. Afterwards, those people were impressed, even a little amazed, by what was done. "Our welders are among the best. They constantly work through all sorts of challenges, including magnetized pipe issues. But a recent project was delayed as all of us tried to deal with a degree of magnetism we had never experienced before. We eventually called MPS to see if they could help. Phil mobilized quickly, and we were welding within minutes of the completion of his set up. I highly recommend MPS. D.E.A. - Pipeline Engineer ". Interested in purchasing this product or have additional questions? Talk to one of our engineers today.